Explanation: Imagine a pipe as wide as a state and as long as the Earth. Now imagine that this pipe is filled with hot gas moving 50,000 kilometers per hour. Further imagine that this pipe is not made of metal but a transparent magnetic field. You are envisioning just one of thousands of young spicules on the active Sun. 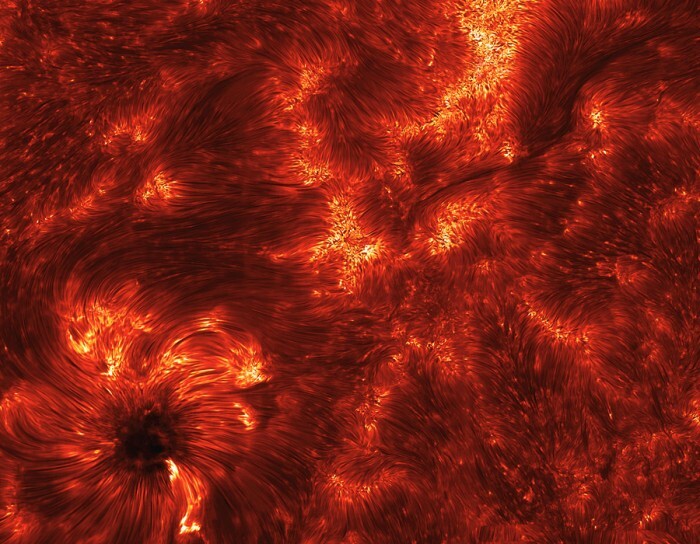 Pictured above is one of the highest resolution image yet of these enigmatic solar flux tubes. Spicules line the above frame of solar active region 11092 that crossed the Sun last month, but are particularly evident converging on the sunspot on the lower left. Time-sequenced images have recently shown that spicules last about five minutes, starting out as tall tubes of rapidly rising gas but eventually fading as the gas peaks and falls back down to the Sun. What determines the creation and dynamics of spicules remains a topic of active research. This is what my nightmares are made of. I can’t look at it without imagining what would happen if someone could fall into it and not burn away already from a distance.